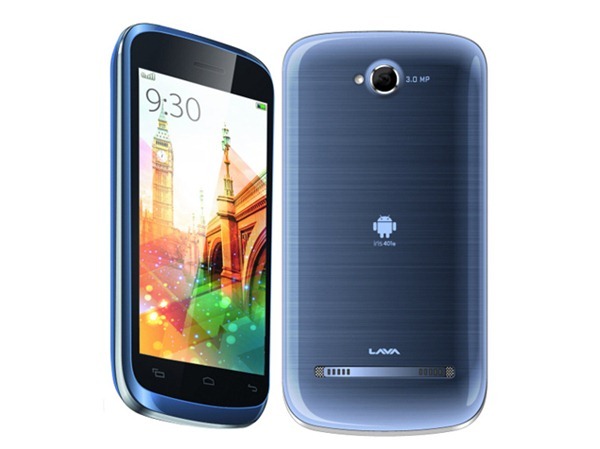 Lava, the Indian manufacturer, have launched the Iris 401E smartphone. The Iris 401E comes with the Android OS and dual SIM functionality, and is currently available online for a price 4,249 INR. This launch from Lava further populates the list of budget dual SIM phones available in the Indian market. The smartphone comes with a 4 inch display which packs a WVGA resolution of 800×480, which also acts as a capacitive touch panel. The device will be powered by a 1GHz single core processor, which will be complemented by 256MB of RAM. As far as storage is concerned, the phone comes with just 200MB of internal storage, but thankfully this can be expanded up to 32GB via means of a microSD card. As mentioned earlier, the phone comes with dual SIM functionality. However, there is no 3G and you can only use both your GSM SIMs on 2G network. Given the lack of 3G, Lava have done away with a front camera, so the device only sports a 3MP rear camera with LED flash. To power the device, there will be a 1500mAh battery which sounds good enough for a 4 inch phone with WVGA resolution. Although the phone does impress with the specifications and the price point, the one catch which might not help is that the phone comes with Android 2.3 which is pretty much out dated even by domestic standards. This is one reason due to which people might not show great interest in this device. Having said that, we should also tell you that at 4,249 INR, this device is cheaper than similarly spec’d Samsung Galaxy Star and MTS Duet. As far as connectivity is concerned, the phone comes with standard connectivity features such as Bluetooth, Wi-Fi, FM radio, 3.5mm audio jack and USB port. The Lava Iris 401e can be bought for 4,249 INR on Flipkart.